Some wonder why conservatives get the impression that many leftists are not patriotic. Well, how about their belief that the ideas of nationalism and patriotism are noxious? We told you! 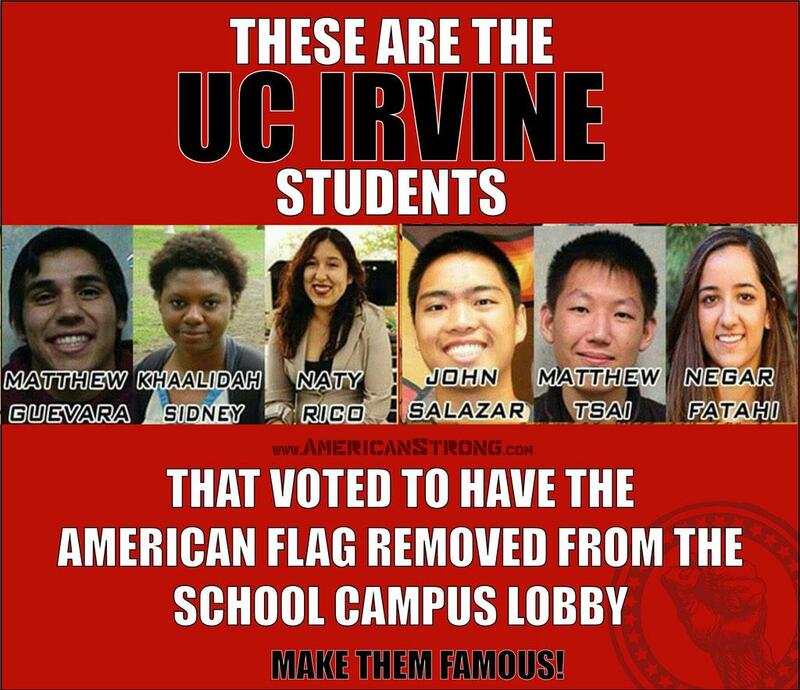 As you’ve probably heard by now, Associated Students of the University of California, Irvine voted to ban the American flag from an “inclusive” space on campus. Don’t you just love loaded liberal words, such as “inclusive,” which mean the opposite of what they imply? Is the American flag includable there? Before proceeding, let me pause briefly to thank my parents for raising me to recognize such psychobabble for what it is and God for the discernment to filter it. This kind of thinking is amazing but is the logical extension of modern leftism. To quote the old Ginsu knife ad, “But wait; there’s more.” The bill also claims that the American flag “has been flown in instances of colonialism and imperialism” and that “symbolism has negative and positive aspects that are interpreted differently by individuals.” Well, what do you know? People have different interpretations? What could be more dangerous? These are your tax dollars at work, training students to be ready for a job upon graduation — at community organizing. After news reports of this insanity, Breitbart News spoke to a UCI student who said she had heard a member of the ASUCI discussing “the (American) flag and how it triggered people.” “Trigger,” she said, was the word the person used, as in “the flag triggers me.” Oh, boy. She speculated that one motivation for the student bill was to prevent “illegal citizens” from feeling bad. To their credit, UCI administrators stated that they did not endorse the bill, calling its passage a “misguided decision,” and the student body’s executive cabinet vetoed the bill. I am not sure what these pointy-heads are referring to with “political immaturity and threat,” but it’s obvious that — typical of leftists — they are projecting. You will notice that the intolerance, immaturity “hate” and agitation involved in this brouhaha are coming from those denouncing Old Glory, not those displaying it proudly. These malcontents said not just “nationalism” but “U.S. nationalism,” and they didn’t show a smidgen of concern for the free expression rights of those displaying the flag. This is the very mentality that leads people such as President Obama to mock the notion of American exceptionalism. They have a desire to defer important national matters to international bodies, have a gross underappreciation for the U.S. Constitution and advocate open borders. They see themselves as citizens of the world, perhaps more than of the United States. Why would you care about people flooding illegally across our borders if you are not keen on protecting America’s unique system of liberty? Why would you want immigrants to be required to go through a naturalization process whereby they learn the basics of American civics in order to attain citizenship if you don’t believe our system is special? I’ll tell you what is offensive and unacceptable, and that is the ongoing distortion of the language employed by these bullies to suggest that positive pride in our nation equates to fear and hatred of foreigners and racism. This is outrageously false, and only those who think that way are capable of accusing others of such warped thinking. If you believe that the American flag is offensive and emblematic of racism and xenophobia, what’s next? Are you going to suggest that we fundamentally transform the United States of America? I can’t help but notice there are no Anglo-Saxons in the group. This is racism against Western Europeans, obviously. That’s what is has been all along this Obama term. They hate us, the flag that represents the roots of the American population, and anything Anglo. And we are the ‘racists’??? The proof is in the pudding,AKA picture. These kids are not even of American dissent. 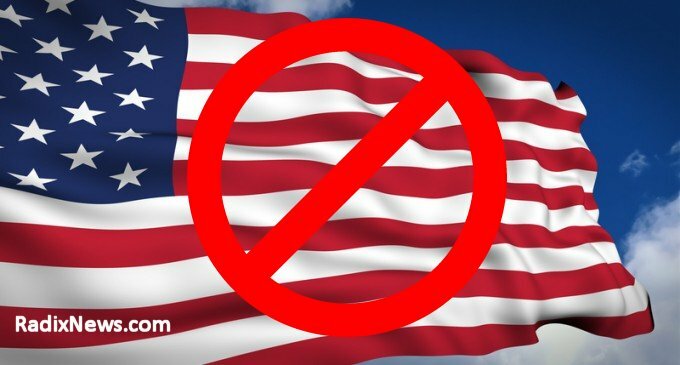 How do I know this, NO real American would vote against the freedoms we have that that flag represents!! Just some damn snotty, pampered, rebels without a clue looking for 15 minutes of (Shame) fame!!! GOD bless America!!! 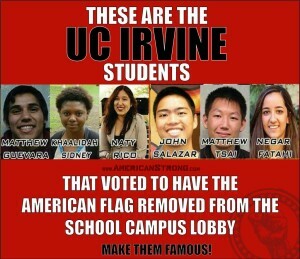 How many of these students are illegal aliens, going to school here on the U.S. TAXPAYERS DIME? I read somewhere that many of them are . The Anti-American brainwashing that the students of today’s public schools begins at elementry school and ends in our Universities and Colleges. Senator McCarthy tried to warn us. But the people instead listened to the very people who wanted the United States to be a copy of the USSR. WELL HE WAS RIGHT! Slowly the United States is becoming the new USSR or perhaps the new USSA!